This recipe I made quite often this winter when comfort food was all I wanted to think about when planning dinners. 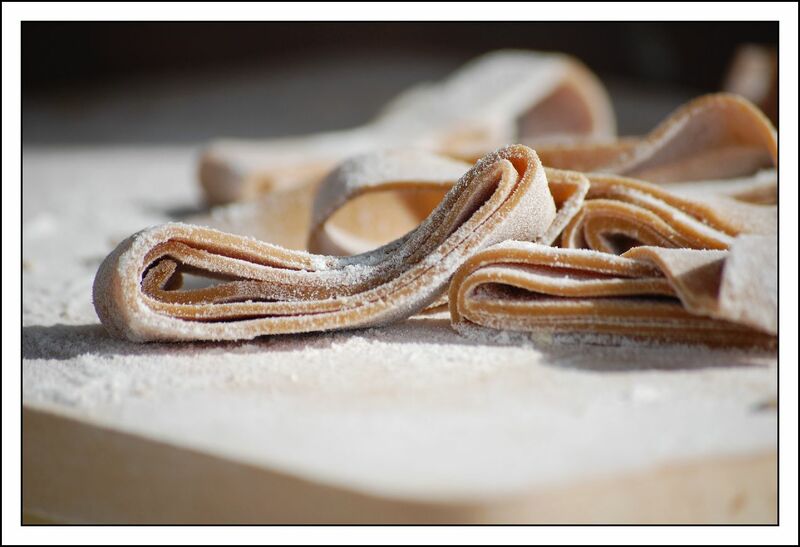 Made with chestnut flour, rolled out by hand and cut into long thin stripes (tagliolini) or wider ones (tagliatelle), takes about an hour from start to yummy. Prepare the dough with 200 gr chestnut flour (keep any remaining flour tightly closed in the fridge as it tends to go rancid very fast once opened), 200 gr all purpose flour, 100 gr semolina flour, 5 eggs and 1 tablespoon of olive oil. Let rest for about half an hour. 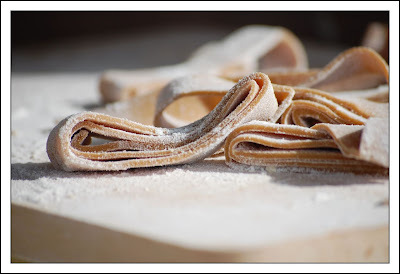 Once rested, roll the dough as thick or thin as you like (I made mine 1 mm thick), dust heavily with flour, roll the dough as you would a cream roll, cut as desired (around 1 cm thick for tagliatelle), unroll the scrolls to stripesand let them rest under a towel while you prepare the sauce. For the sauce, heat some butter in a pan, add 200 gr of sliced mushrooms (champignons are fine), 200 gr of pancetta or very thinly sliced bacon and 100 g of walnuts. Let brown. Add salt and pepper to taste. Cook the pasta , drain, add to the pan with mushrooms and pancetta, let mix the flavours for some seonds, serve with freshly grinded black pepper.